Earlier, as I left my home and got in my car to go meet a friend for a meal, I decided to make a quick phone call. Bluetooth can be a beautiful thing. The person who I had just called answered when I heard what sounded like a smash ahead of me. Evidently, I said this out loud before even saying hello to the person I had called. My distracted presence on the phone coupled with my statements of confusion had her a bit scared. I told her I was fine, and I’d call her back. I pulled up next to the young man who had just smashed his car into the tree-filled median. Several cars from the other direction going into the subdivision had stopped as well. Thankfully, no other cars were involved—just one car and a tree. The hood of the black jeep molded easily around the medium-sized pine. If keeping score, the tree was the winner as it stood firm against steel that caved. The clean-cut, dark-haired youth sat in his car talking on the phone. I noticed he was still buckled in his seat and that the airbag had deployed. I called out through the open window and asked if he was okay. I wondered if he had been distracted just as I had been a moment ago. Maybe he was on the phone talking when he lost control. Or perhaps he glanced down to read a text or noticed an Instagram or news story pop up on his feed. He didn’t appear to be going too fast; no roaring engine sounds or tires screeching were heard prior. But the speed and pressure were enough to deploy his airbags. The young man exited his car with ease and grumbled as he made his way to the other side to retrieve his backpack. He looked more annoyed than shaken. Perhaps he was late for class and was envisioning the lecture and reprimand he would likely receive from his instructor and parents. The onlookers left once they saw he wasn’t injured. I asked if he needed a ride somewhere or if I could call anyone for him. Without looking at me, he said his parents were on their way. My concern and questions seemed to aggravate him although I did not take it personally. I told him I was glad he was all right. As I drove away to meet my friend, I hoped he and his parents would recognize how lucky they were—he wore his seatbelt and was unharmed. The incident served as a reminder to me as well. While the bill for a car crash and repairs is annoying and costly, the lesson to slow down, always wear your seatbelt, and focus while driving is priceless. 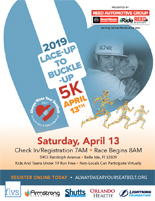 Florida Virtual School is proud to be part of the 2019 Lace-Up to Buckle-Up 5k on Saturday, April 13, 2019 in Orange County (5903 Randolph Ave., Belle Isle) with the Always Wear Your Seatbelt Foundation. 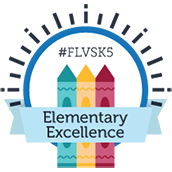 FLVS volunteers will be on-hand with giveaways and information including the Driver Education/Traffic Safety course at FLVS. If you’re in the neighborhood, stop by and enjoy the fun! 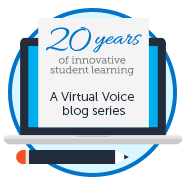 This entry was posted in Parent Edition, Student Edition and tagged Driver Education, driver education and traffic safety, Driver's Ed, Driver's Ed Online on April 12, 2019 by Suzan Kurdak. It is scary to think that this can happen to anyone. Can I also please use this for an argumentative paper that I am writing. Hi Lindsay, absolutely! I’m sure our Driver Ed teachers would be happy to provide additional information as well. Good luck with your paper! I know what that is like. I agree bluetooth is beautiful. It saved my life in the biggest accident I was in. It blocked glass from getting in my head because it was so large for a BT (Bluetooth) speaker. Accidents are scary. I sprained my leg in the accident.